Excerpt from Wendi Jo Vande Voort is a Fall 2016 student from Dordt College. Reproduced with permission. I wrote this overlooking blossoming almond trees while procrastinating. I had fully intended to do homework for an hour each day over spring break and obviously, that went as planned. Not. At least I did not procrastinate as much as I could have – as the revised and edited version was brought about two months later after catching up with friends I made while in Australia. So, here are my revised thoughts pondering how my life has changed since my time in Australia. (I was in Australia from mid-July to early November of 2016). In February, I had the privilege of providing advice to a friend of a friend who recently went on the adventure and opportunity of a lifetime at the ASC. I pray your journey was pleasant and yet a challenging adventure. If I had to describe the impact of my time abroad in another country for 3.5 months, 16-time zones away from my support system, and about 22 hours of flight away from home: it was terrifying, marvellous, and one of the most meaningful decisions of my life. The world’s a stage: my home throughout the safety I find in the rural countryside. 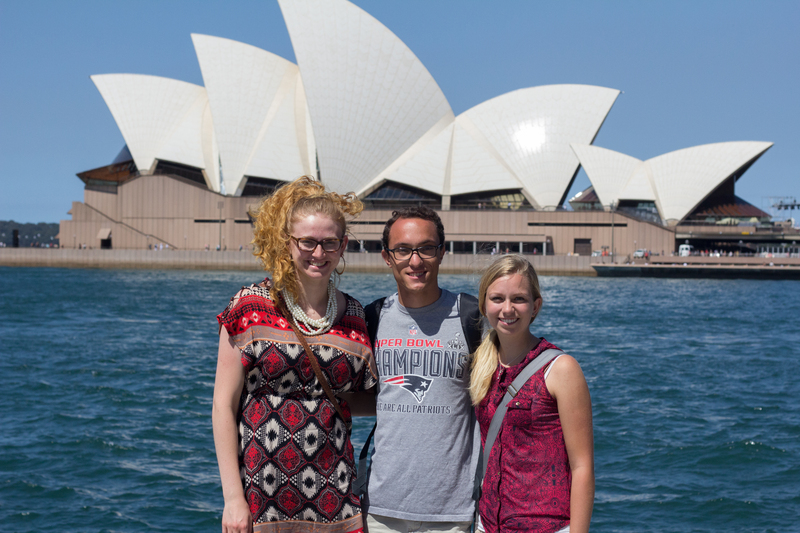 I have learned something important about the place I call home since my study abroad. Home is where I find God’s country as many farmers and ranchers call the rural countryside. Home is where I can breathe in the fresh air, smell livestock, and touch an ever-changing living plant. Home is my comfort zone. Home is my safety net. Home is the lands in which agriculture rises and falls with the markets. Home is where my heart, soul, and passion thrive. Home is the driving force which reminds me to pursue my career goals. Throughout the Australian outback, the rolling hills in Iowa, the rows of almond blossoms in California, upstate New York’s classic New England-looking farms, or New Zealand’s lush hills overflowing with sheep I feel at home. I will forever be a practicing minimalist. I can pack like a queen, also known as packing the kitchen sink, according to some. So, when you are told you get one fifty-pound checked bag (and two extra-large carry-ons) for 3.5 months we have a problem. You truly learn what you can and cannot live without. I returned from Australia with many of the belongings I left the states with, but I had a deeply changed mindset. Stuff mattered much less. People and relationships mattered much more. Buying plane tickets to go on adventures and visit friends was much more exciting than buying a new piece for the ever-perfecting wardrobe. (Although, I did buy some clothes.) Going home with souvenirs – who needs those? I got photographs, friendships, and memories. Here’s a worldview, beaten to a pulp by my own doing. I went to Australia with what I thought was a well-developed worldview. Then I lived among the worldviews of a people with different histories and mindsets than my own. I took their worldviews and my old worldview to develop a completely reconstructed perspective of life – especially related to politics, world issues, and faith. What better way to reinforce what you truly believe then to challenge it. I have an awakened appreciation for culture. I lived under the impression much of my life that I fully appreciated other cultures. I was wrong. I thrive on an unconscious white privilege if you will. I still do not quite understand it, but I am learning. Learning to accept portions of cultures I do not agree with and choosing not to instantly go on defense has been challenging. Every culture is subject to differences, and that does not mean one way of living is incorrect from another. Only by grace can you accept that sort of mindset. A friendship that started out as complete strangers, turned into something as strong as a family, and I’m an introvert (but a bold one). To the GI of GIJO and the Roo Hunter, may our adventures (so far) in Australia, New Zealand, and New York remind us that distance means nothing when memories can be retold a thousand times over. It only took us a weekend trip to the Sunshine Coast within the first month of the semester to realize we were the three musketeers. For your advice and friendship, I am forever indebted. Then for my advice about relationships – your welcome. *Insert crying laughing emoji. * May our short time together have lasting effects on our lives in the future. Be still and know that God is still God, and God is still good. I was terrified something would go awry when I was away for 3.5 months, but nothing traumatizing happened. I had to learn to let go and let God lead my life. As a type A person, someone who finds perfection the epiphany of life, I struggle to let God lead my life. Going to a place completely unknown to me and living life out there for 3.5 months taught me a lot about trusting God, listening to his will for my life, and knowing God would be there regardless of the situations I would face. Like I said, study abroad ruined my comfortable life. But, the new ways I have chosen to live are some of the best decisions I have made. P.S. For the record, American coffee, especially if you are the Australian espresso black coffee-type, is not going to cut it for you. Still trying to figure out how to afford a $700 investment in an espresso machine and a coffee grinder… Sincerely, a coffee snob who can make her own espresso thanks to a day crash course in making and serving espresso. (I have certification and everything.) Disclaimer: I promise I am a good person, I just like excellent coffee. If you are ever in NYC, GIJO have put the seal of approval on Bluestone Lane Coffee which has a handful of locations within the city. 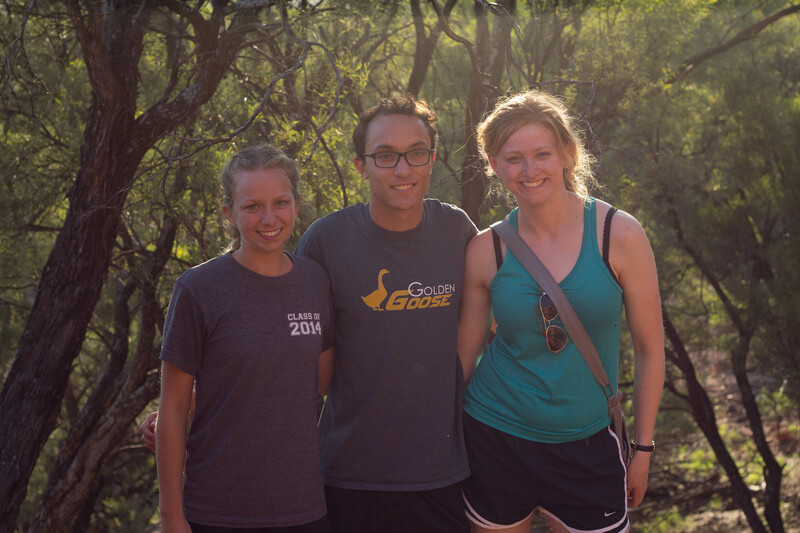 The two parts of GIJO (Gianna on left and Wendi Jo on right) and the Roo Hunter (Caven in center) in the Outback.